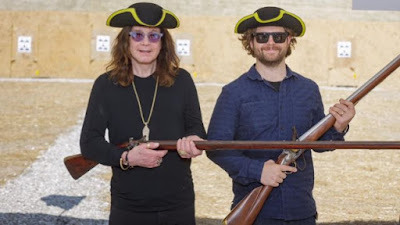 Ozzy Osbourne and his son Jack will star in a new a new show produced by the History channel called "Ozzy & Jack's World Detour." The 10-episode hour-long series will see the pair tour the world to visit a bucket list of iconic and historically significant spots that includes Mt. Rushmore, Stonehenge, The Alamo, Roswell, The Jamestown Settlement and Sun Studios and a hit list of some fascinating sights and people that they've read about. From a Cold War-era Missile Silo to Bletchley Park; from gold miner Rattlesnake Randy's stream of dreams to vintage tank collector Allan Cors's private museum of working war machines, Ozzy and Jack get their eyes and hands on history. “Jack and I are doing a thing for the History Channel, like a father and son spoof on history,” Ozzy told Billboard last fall. “We went to Stonehenge and met a guy who thinks he's the reincarnation of King Arthur. And we went to Bletchley Park to see the machine Alan Turing used to break the German kind. We're going to Mount Rushmore, to the abandoned silos where America used to have their Minutemen missiles and all that. “Ozzy and Jack’s World Detour” will premiere July 27 at 10 p.m. on the History channel. Ozzy has made headlines recently with a different kind of detour, as wife Sharon says she has split with the rocker over accusations that he’s been having an affair with 45-year-old celebrity hairstylist Michelle Pugh. Sharon reportedly hired a private investigator to look into the matter and sources say she discovered Ozzy was basically living a double life after learning that the singer was spending a lot of money without her knowledge and it turned out to be on his mistress. Meanwhile, Ozzy and Black Sabbath will continue their farewell tour with dates in European next month before returning to North American for more shows this fall.